I got my first review of Bachelor Chow today. One of my lab-mates blended up a batch and said that it was filling but bland. I am actually satisfied with that review. I made Bachelor Chow to satisfy three requirements – cheap, simple, nutritious. Flavor really didn’t come into that equation. It ended up being acceptable anyway. 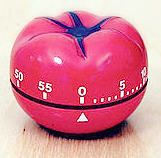 The Pomodoro technique is named because it uses a 25 minute timer. The original timer looked like a little tomato (Italian for tomato is Pomodoro). Your timer doesn’t have to look like a tomato. The point is that you set your timer for 25 minutes, then take a five-minute break. Effective five-minute breaks work when you do absolutely nothing. The point is to let your brain relax. Stare out a window. Stare at a wall. Just sit quietly. At the end of five minutes you will be very bored and want to get back to work. I wish my University had provided a good introduction to study techniques. When I used to ask my professors how to study for their class, they would often answer, “Study all the things, all the time.” In some sense, this is good for your education. The professor would be cheating you of your full experience of the material if he said “just study this subset of the material.” If that was what he wanted you to learn, then he would have taught a smaller amount of material. Still, it was not very helpful. Some famous people have been known to use standing desks. Benjamin Franklin, Thomas Jefferson, and Winston Churchill for examples. According to Wikipedia, standing desks were popular in the 1700s, so maybe it’s true about the Founding Fathers. I like to use a standing desk because it gives me a sense of urgency and momentum.